People think they know the story of General Pinochet. 95% don't. In many respects, all you have to do is look at the political and economic stability he left Chile and compare it to the leftist dictators' legacy in Latin America. It speaks for itself. My long time readers know my views; no reason to go over them again. There is a lesser known story that all should know, and fleshed out the debt Britain owes the General. The following is from a man I wish we could have as our Secretary of the Treasury or Federal reserve; the great man José Piñera. General Pinochet and the Falklands War. In the first days of April 1982, shortly after the Argentinean invasion of the Falkland Islands, the Head of Intelligence of the Chilean Air Force relayed to me that a Wing Commander of the Royal Air Force had arrived in Chile with a personal message from the Chief of the Air Staff of the RAF, and requested an urgent interview. I saw General Pinochet, who was not at all surprised at the British request. We carefully analysed the request and its possible consequences. He authorised the operation on the condition that under no circumstances could Chilean territory be used by the British mount any operation against Argentina. 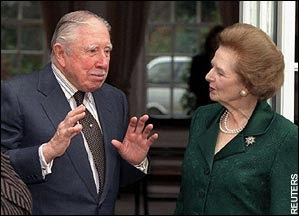 General Pinochet also instructed me to keep our own Ministry of Foreign Affairs out of the picture. I would like to point out that there was no other person present at this meeting. Wing Commander Edwards was given a complete briefing on the Argentinean Air Force by our own intelligence team. He was then given free access to our air operation centre in Punta Arenas, where we monitored all Argentinean air force operations through our long-range radar and our ground-based communications equipment. Wing Commander Edwards carried a portable radio with a direct satellite link to the staff of the British Task Force. During April 1982 we worked hand in hand with the British. An RAF Nimrod was flown to Chile to perform an electronic and communications mission for mutual benefit. As it flew strictly over Chilean territory, I considered that we were not violating the land rules laid down by General Pinochet. The Royal Air Force also shipped six disassembled Hawker Hunter planes to Chile on board a C-130 transport airplane. Other C-130s brought a long range military radar, which we installed following British wishes opposite Comodoro Rivadavia. I would like to mention that the C-130s came via Tahiti and Easter Island, because at the time no other South American country would allow overflight of British military airplanes. At the end, I would like to mention another event of great consequences. At the very end of the Falklands War, on June 8th, two British attack transports, "Sir Gallahad" and "Sir Tristam", were attacked and destroyed by Argentinean fighter bombers with considerable loss of life. That day, after several months of continuous operation, our long-range radar had to be switched off for long-overdue maintenance. The Argentinean forces were then able to achieve a complete surprise attack. One can only speculate how the British Task Force would have fared, without the half-hour warnings on Argentinean air strikes provided by Chilean intelligence. Well, Oliver North was an O-5, too. It was the days before the military became a corporation.